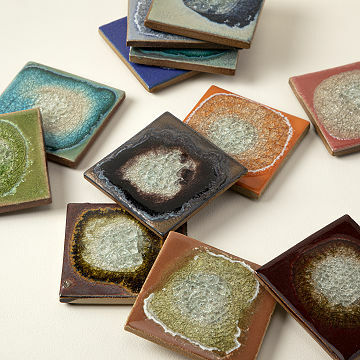 These stoneware coasters feature a crackled glass glazed surface that resembles geode slices. Resembling the crystalline, geological complexity of geode cross-sections, these stoneware and glass glazed coasters bring handcrafted beauty to functional home decor. The organic interaction of stoneware, glass, and colored glazes produces a unique, crackled surface with fascinating variations that make each coaster in the set one-of-a-kind. Handmade by Kerry Brooks in Minneapolis, Minnesota. As a ceramic artist, Brooks strives for aesthetic harmony in all of her work, but mostly wants the user to enjoy the work and for that enjoyment to deepen the more one uses her pieces. Brooks has had the good fortune to make a sustainable living selling her work for the last 20 years. Her formal training as a ceramic artist took place in Ann Arbor, Michigan from 1998-1992 and Minneapolis, Minnesota has become both her literal and ceramic home since 1993. The Midwestern ceramic tradition is a robust and well-established one that has seeped into her bones and will always be detectable in her work. Brooks feels truly blessed to be able to create art that she loves so much. My parents loved the coasters! They thought they were beautifully designed and crafted, and look forward to using them on their patio. Purchased as a gift, recipient already looking to purchase more. Agate is fragile but this glass art is tough. Lovely way to bring art to the coffee table. I try to find unique pieces for my friends and family that will suit them. Some are harder than others and uncommon goods has anything that you would ever think to want. I wou buy this product again if they mixed the two colors l.
I wanted a mixture of them like the picture showed but you couldn't do that without buying two sets. I do like the look of them with the cracked center. Makes them stand out. I really love these coasters, they are unique but very stylish! I love the crackles glass in the coasters! My sister is a talented potter, so I appreciate the artistry in each piece. These are beautiful and elegant to use in any room! I am using them in my living room, sunroom and guest rooms.